Planter is a decorative container for a plant or small tree. Planters made of marble serve as beautiful garden decorative and truly enhance the look of the garden. 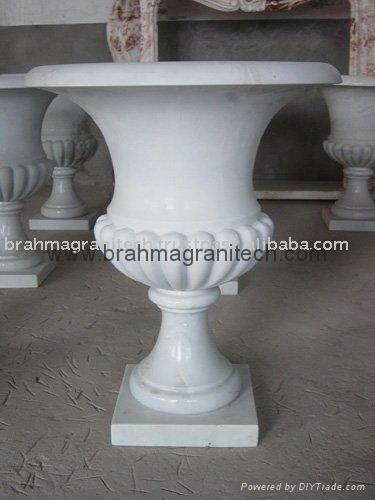 Marble planters are very durable and can withstand all kinds of climate variations. They are available in many sizes & shapes and can be custom-made to match individual buyers preferences. The surfaces of marble planters can be finished in a number of ways - smooth finishes tend to emphasize color and veining, whereas rough finishes tend to subdue the veining or markings. The marble planters are intricately carved and stand out with the striking patterns, sharp details and high polish. They are valued for natural beauty, strength and durability.